This hymn was written in rural England in the mid-nineteenth century, when the life of the village during the winter depended on the bounty of the autumn harvest. While the first stanza of this hymn rejoices over the harvest, the last three stanzas expound on the reminder this image gives of the Parable of the Wheat and the Weeds in Matthew 13. The hymn concludes with a prayer that the final harvest at His Second Coming would happen soon. In 1844, Henry Alford published this hymn in his Psalms and Hymns, under the title “After Harvest.” He was rector of a rural parish in England at that time, and the text was written for a harvest festival. 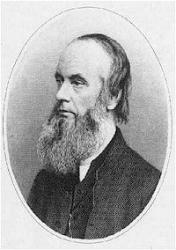 Although it was originally written with seven stanzas, Alford revised and shortened it to include only four in his Poetical Work s in 1865. He wrote in a footnote there that he did not approve of the various other revisions that had been made without his consent. Nevertheless, the standard text now in use is significantly different from Alford's in the fourth stanza. 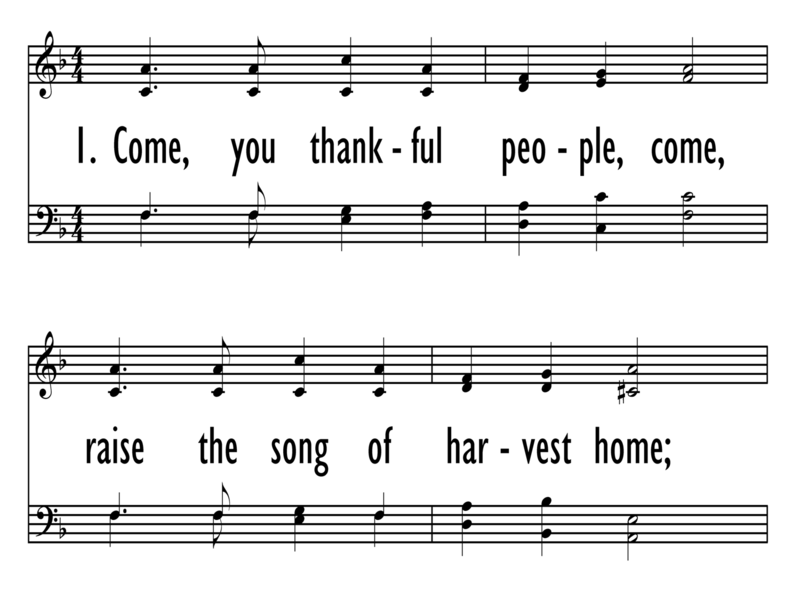 “Come, Ye Thankful People, Come” combines the image of an autumn harvest (st. 1) with two of Jesus parables, from Mark 4:26-29 (st. 2, second half) and Matthew 13:24-30, 36-43 (st. 2-4). It is commonly sung as a song of rejoicing over a bountiful harvest, which it appears to be from the first stanza. However, it is really a more sobering text and may have been intended to provoke Christians to consider whether they are truly people of God (represented by the wheat in Jesus' parable of Matthew 13), or merely lookalikes (represented by the weeds – also called “tares” in some translations). The second stanza closes with a brief prayer that God would enable those who sing to be true Christian disciples, while the fourth stanza is a prayer that the Lord would soon return for the final harvest. George J. Elvey was the organist of St. George's Chapel at Windsor Castle for 47 years. He wrote this tune for a text by James Montgomery, and the tune was published in E. H. Thorne's Selection of Psalm and Hymn Tunes in 1858. It was named ST. GEORGE'S WINDSOR after the chapel, and was first matched with Alford's text in the 1861 Hymns Ancient and Modern. 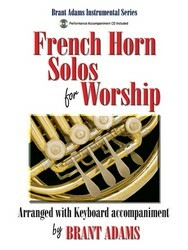 This tune works well when sung in harmony. 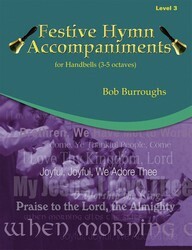 The opening rhythmic motif is repeated throughout the tune, making it easy for congregations to sing. 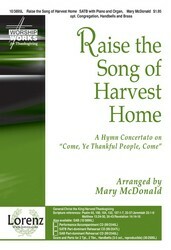 This hymn is traditionally sung for Thanksgiving, and is also appropriate for a service with a sermon on Matthew 13. For a Thanksgiving service focusing on the joy of a good harvest, a short choral introit using only the first stanza of “Come, Ye Thankful People, Come,” accompanied by organ, piano, and optional handbells, is appropriate. Also for that occasion, “Come, Ye Thankful People, Come” and “Now Thank We All Our God” are commonly used together, as in “Come and Give Thanks,” a rhythmically interesting medley for a brass quintet and piano. Display Title: Come, ye thankful people First Line: Come, ye thankful people, come! Tune Title: ST. GEORGE'S WINDSOR Author: Henry Alford Date: 1992 Source: Psalms and Hymns, 1844, alt. Display Title: Come, O Thankful People, Come First Line: Come, O thankful people, come Tune Title: ST. GEORGE'S WINDSOR Author: Henry Alford; Anna Laetitia Aiken Barbauld Meter: 7.7.7.7.D. Scripture: Exodus 23:16 Date: 1995 Subject: Adoration and Praise | God; Rural Life | ; Seasons | Thanksgiving Day; Year B | Proper 6 Source: St. 3, composite of Alford and Barbauld, alt.